Good dizzy with rain morning Mayuko! Good morning chresti! Happy to have you here! How do, Mayuko and all! Good to see you again, james, and my radio family fred! That's very sweet interpretation, Rickwaukee! If only. Awww, PM Dawn after 80s/90s new jack! Excellent. Lunar New Year is coming..
Good morning Mayuko and all! Excited to see where this new edition of Vertigo takes us. Gonna just star this show now. Good afternoon, Mayuko and fine young listenerds. Oh no!! Ralph Tresvant's here to haunt you too, james!!!!!!!!! Hallos, Joe B!! Glad to have you all west-coast listenerds here today! Oh yeah! Happy Lunar New Year!! And hallos, coelacanth∅! Happy to have you guys here! Year of the Pig ... and how! Thanks for tuning in Henry, and Goldensun san!!! Hello, Mayuko, the vertigo-getters, and lucky passers-by scanning the Stream for something good. I wish it was Year of the Oarfish. Hi Sem! Hope you're staying warm!!! @Ken ha, Japanese people would freak out - they think it's a bad sign to see them on beaches. Glad you didn't get frozen into an icicle, P-90! @fred ah! That's a very cool take of it!! thank you for remembering that. @fred "The Possessor Possesses something" it suddenly has no poetry feel to it!!!!!!! Glad you dig though! I love that Higher Energy track! Hmm... I wonder if I will be able to hear Dave today? There's another song called "Sensitivity" I like off of Jeffrey Lee Pierce's solo album Wildweed. Such a lovely journey with Play Vertigo! @Rickwaukee If doing this show won't help I need to custom make that sign. @paul b Is it another song about another man who claims to be a sensitive man, or a song written by truly a sensitive man? @Dropof it's really strange that you've been having such struggles!! You might have to download the fmu app on your phone to enter that free world if you haven't yet. We adjusted the bitrate that Dave's connection is streaming at. Fingers crossed that it solves the problem. Hi Jesse! I think it's maybe easier with my show to sit still and work and not be dancing around in the studio, haha. We can only hope for a first rate bitrate. I like that uncertainty is acknowledged. Mayuko I do have the app and it works just fine. I just would prefer to listen at work on my pc. Doug, fingers crossed here too. I'll let you know as soon as the show starts! Rain cancelled work today. Happy to listen and comment today! 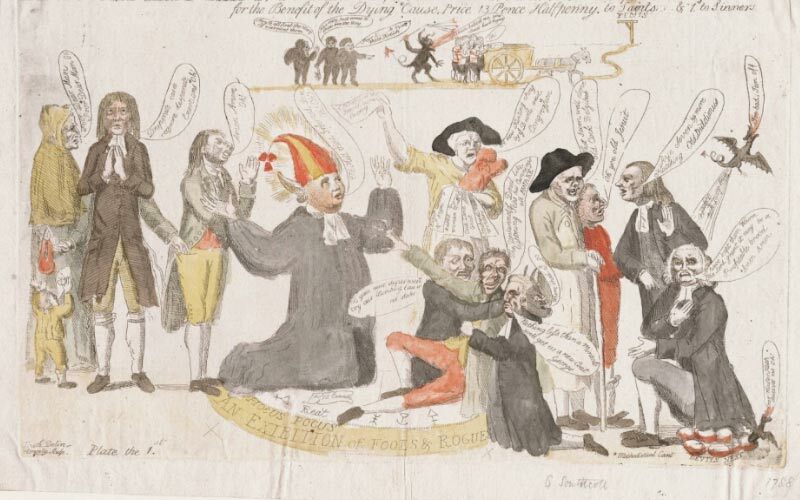 It's pretty amazing that those cartoon speech bubbles were around all the way back in 1787. @Mayuko Sense I get from the song the narrator is speaking to his lack of sensitivity, but is torn up about it. I like handmade dulcimer things. @chresti ... Or also to stay still horizontally. I'm glad to have you listening live too!! Good morning! What's goin' on? I heard something about exorcising a sensitive man. @rbrt yeah! must have been fun to see him perform his music with that and his chopsticks and old door and all. Top of the rainy morning to you, rw! @Joe B I couldn't find exactly when the illustration was made, I only know that just the exorcism of George Lukins happened then. @paul b That sounds to me way more like the way a sensitive man would talk!!! @rw I don't know if you were in California already back in 1990, but if you were, you must have been chased by that sensitive man too like I did. Still traumatized. Today is the day for us to be liberated. @rw to be clear it is "♫You need a man, with, sensitivity ♪a man like me" That haunting thing. @Joe B Wow, good eye! You ARE a man with sensitivity! Thank you!!!!!!! @Mayuko haha, don't know about that. Btw I looked it up and the earliest types of speech bubbles appear in Mesoamerica around 600-900 AD! Mayuko, I don't remember that song. I kind of skipped over the '90s. He does look darned sensitive on the internet though. Feeling any better now? Or will the exorcism be lasting another half hour? @rw: Did you ever hear the Kenny G exorcism show? Oh, I see the entire show is an exorcism... good luck with it. Seems to be working for me and I'd never heard the thing! fred, no. You mean the DJ KG? Or a show about exorcising the sax player? And by the way Mayuko, at the beginning of the show I was wondering what the hell you were up to but trusted that you knew what you were doing. Wow. The answer to the math problem I had to solve to post that last comment was 666. @fred I don't know much about Yves yet but I think one of his labels said he's from there. rw @1.37 haha same here! Enjoying the show, doubleplusgood, Mayuko! On the way to the post office. Will be streaming along. May you have an interesting week, Mayuko, and thanks. @rw you didn't get trapped even though you were there then!?!? It was so much fun listening to Bell Biv DeVoe and New Edition and all that on the radio then - it was sad how Bobby Brown had to die like that. @rbrt I'm interested. Sometimes I think about what my own skull might look like. @Joe B OH WOW! 600-900 AD?!?!?! So cartoon is an ancient art form!! @rbrt Me makes two of us! That museum was fascinating!! rbrt that's interesting, and apparently the skull collector had good intentions. my skull probably looks better than my present appearance suggests! welp, did everybody see their shadows today? Thanks Mayuko! Have a great week everyone! Too much work keeping me from the chat lately. i haven't seen my shadow today. i just assume it's in the kitchen, enjoying some tea. thanks for the selections and the skulls! Thanks Mayuko, have a nice week! Thanks Mayuko for magical show! Thanks again Mayuko! Might have to catch next week's show on the archives -- going on a desert excursion. See everyone in a week or two! Thanks for the show - Sending Heat your way! Mayuko! Play Vertigo is too short. Thank you! May the ghost of Ralph T. be banished forever! Joe! I'm supposed to go out to the desert thing on Tuesday. Hope it's not raining. Later kids. Have a good one! @Joe B A desert excursion sounds wonderful! Enjoy!! Stay tuned for Music For a Free World with Dave Sewelson!!! Thanks again everyone for listening! See you next week!! !